7 – Get lots of change. In order to get your pressed pennies, you will need a lot of change. Not just any change either! You will need quarters and pennies. It costs 2 quarters and 1 penny for every pressed penny that you want to collect, so you will want to make sure that you have exactly that ratio of those coins for as many pennies as you think you will collect. I’d also recommend bringing extra than you plan, just in case. You never know how many you will end up wanting and what surprising pennies you might find. 6 – Get the newer, shiny pennies. When you are picking the pennies to bring for the machines, try to pick the newer shinier pennies. These will help give you the prettiest and best looking pressed pennies for your collection. If you don’t have pretty ones in your piggy bank, you could always take them to an actual bank or a store and try to trade out for their shiny pennies. 5 – Set up an organization system. It will be important to be organized. You will have to carry your money and the pennies that you make for the day, so you will want a way to carry them that will be easy to access and safe within your bag. The favorite way to carry the coins for many collectors is to use the tube from M&M Minis. It’s a great excuse to eat candy, and then makes an amazing way to carry your money to buy your pennies. Empty one of the tube and then stack the coins as 2 quarters, 1 penny, 2 quarters, 1 penny… and continue in that order. This will make it to where you can grab just what you need quickly and not spend time sorting through change. Be sure to bring another container that will safely hold your pressed penny collection so they are safe until you get back to your room. 4 – Don’t carry all of your collection with you each day. It is a really bad idea to carry your pennies around with you from day to day. They are much safer back in your room. Bags get lost or forgotten, items can fall out, if you have a nice carrying case the rain could get to it and damage it, etc. It is just a better idea to only carry what you have collected that day and deposit them at the room anytime you go back. That will keep your collection safe and then you can organize them at the end of your trip. 3 – Don’t forget about the resorts and non-park locations. 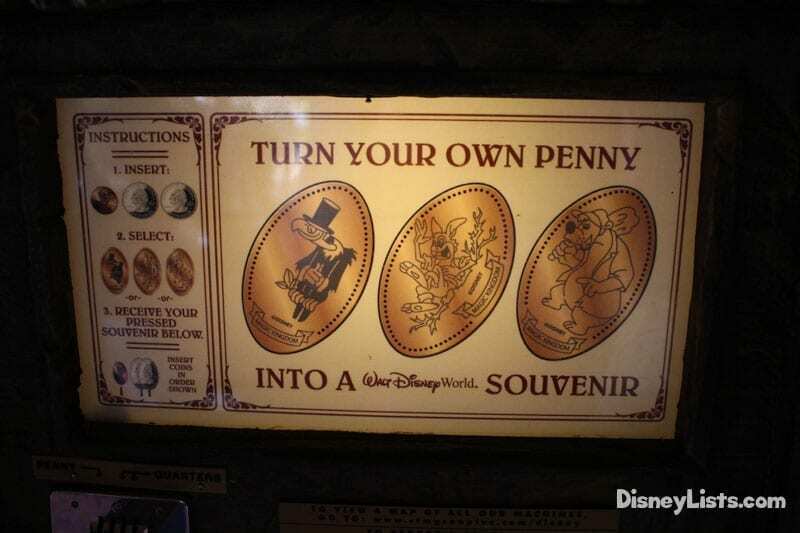 There are penny pressing machines at other locations besides the 4 major parks. The resorts and other areas are great places to get some pretty unique pennies. They are also a great excuse to venture to the resorts and explore areas that you have never visited before! Add them to your map and penny list as you work to expand your collection. 2 – Map out the penny locations. Be sure to do several Google searches and look at various documented pressed penny logs online so that you can map out the ones that you want to collect along with their locations. It will be much easier if you create a list and map the locations so that you don’t spin your wheels trying to find them or worrying about whether you are missing great spots. We love anything that will save us time in the parks and free up more time for rides, shows, characters and other fun! 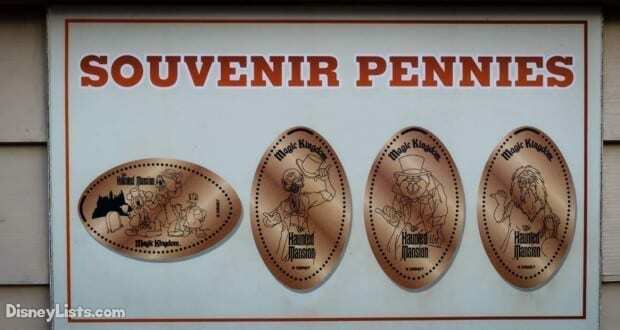 For a map of pressed penny locations around Disney World, click here. 1 – There are also pressed quarters! If you love the larger, shiny quarters, then be sure to prepare for some of those, too! 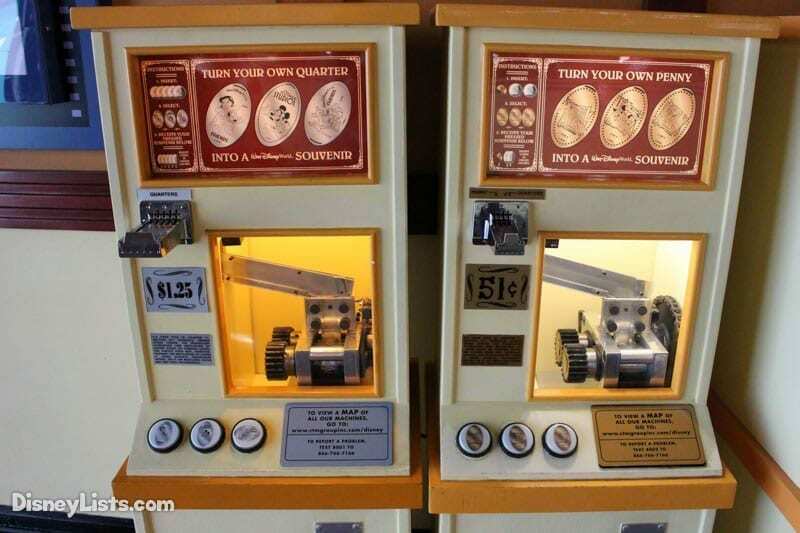 There aren’t as many of these machines as there are penny machines, and the quarters may not fit in some of the various collection books as well as the pennies do, but they are still pretty cool. The cost for these is $1.25, so you will need 5 quarters total, one of which will get pressed.